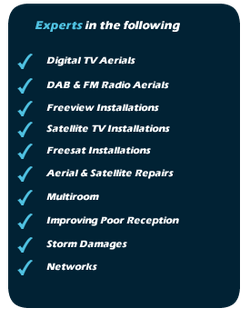 Down Satellite specialise in the installation of aerials, satellite systems, magic eyes, distribution systems, everything you need for either domestic or commercial premises. Based in Co. Down (Northern Ireland) with years of experience in the trade, we provide a professional service at a competitive price with all installation work guaranteed. We also supply televisions and equipment, click here for more information. We place great emphasis on finishing all installations to the customers satisfaction.